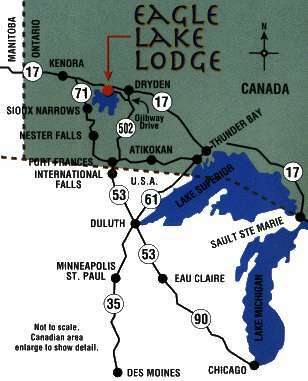 Our lodge is 4 1/2 miles from the town of Eagle River on Hwy. 594 - a total of 20 miles from Dryden airport. BY CAR: Cross the border and clear customs at Fort Frances, Ontario. Drive east on Hwy. 11 to the junction of Hwy. 502. Turn north on 502 to Ojibway Drive, then west 10 1/2 miles to Eagle Lake. Total distance from the border to camp is 120 miles. BY PLANE: Private planes can land 1/2 miles west of our lodge on a sod airstrip. Strip is 2600 ft. long by 250 ft. wide. Direction is NW-SE, the direction of the prevailing winds. Float equipped airplanes can land at our own harbour facility. For larger aircraft, Dryden has a modern jet airstrip and we can arrange to have you picked up. You can clear customs at the Dryden airport.